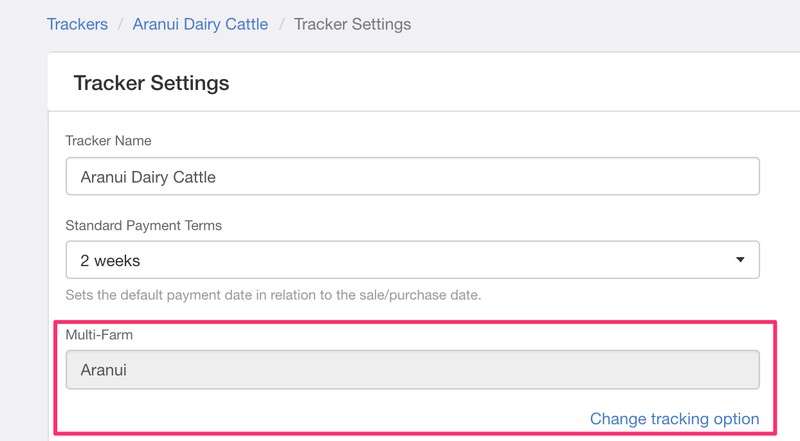 Once you've enabled your farm for multi-farm, you'll need to head into each of your Production trackers and assign the applicable tracking option as per Xero. This will allow you to use a single chart of accounts across as many Production trackers as you have tracking options. To do this, simply head into Tracker Settings, and choose Change tracking option. This will load a new page where you can select your applicable tracking option. This will mean for all future payments you wish to have showing under your Production tracker, the payments in Xero must use the same tracking option. If you do not use the tracking option that has been mapped in Figured, then your dollar values will drop down into a generic Other Income / Direct Costs heading, as opposed to sitting under a specific Farm > Production tracker. NOTE: If you change a tracker with an existing tracking option, you will not be able to change this to one with an existing "like" tracker already setup. For example if you have a Sheep Tracker under Farm A, and you attempt to put Sheep Tracker 2 under Farm A as well, Figured will not allow this. Now you can move onto budgeting & reporting [link here] in your multi-farm.